For all intents and purposes, The Judge is a dad’s movie – we know that sounds like we’re stating the obvious, given it’s mostly about the reconnection of a father and son, but everything about this movie feels geared toward the older generation of moviegoers who admire the old-school methods of filmmaking and slower, padded-out moments of drama. This film certainly packs itself with plenty of those qualities, but possibly too much so in that it results in something a little overstuffed and ready to burst at the seams. It’s a brave attempt by director David Dobkin, previously best known for more light-hearted affairs like Wedding Crashers and Fred Claus, to try and do something a little different than his usual attire, but it becomes clear a little way into it that he doesn’t quite have the grasp of heavy human drama that he thinks he does. Take one scene for instance, involving both Roberts Downey Jr and Duvall (both excellently cast, delivering some excellent performances here) where one has to take care of the other after a messy bathroom incident. A stronger director would have played this scene more straight, exhibiting the drama and tension between both their prickly personalities. Instead, Dobkin inserts a few laughs throughout the scene, and even ends it with at least one of them laughing at their predicament. It comes off as fraudulent and rather distasteful, especially given the circumstances, which in itself reveals that Dobkin can’t shake off his frat-boy comedic roots despite his and regular Spielberg cinematographer Janusz Kaminski’s best efforts. 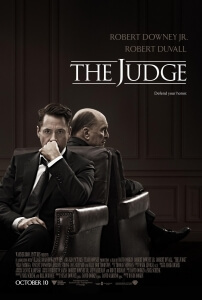 By far and away, Downey Jr and Duvall are the most enjoyable things about the movie – both excellently suited to their individual characters, they deliver some truly strong performances here that marks minor milestones for each (for Downey Jr, it’s a sign of showing more diversity in an era where he’s the go-to guy for franchise blockbusters; for Duvall, it’s a sign that he’s still very much a major presence in modern film despite fewer film roles and appearances for the Godfather actor). Both are also arguably the most rounded characters in the entire film, which unfortunately spells bad news for most of the other supporting actors who are thus given lesser material to work with. Vincent D’Onofrio, despite being billed as one of the major players in his role as Downey Jr’s older brother, only seems to act as an outside observer to everything without contributing anything significant himself, while Jeremy Strong is saddled with a misguided mentally-impaired role that is once again completely pointless in the overall scheme of things (his character also feels like the very type of mentally-challenged role that Downey Jr commented on in Tropic Thunder). You could also cut out Vera Farmiga’s love interest as well as a few other characters and absolutely nothing in the main storyline would have changed; but the biggest disappointment is that Billy Bob Thornton is given a very one-dimensional antagonist role as the lawyer hired to prosecute Duvall’s character during the trial. Don’t mistake us, all these actors definitely give good performances no matter what but it’s as if the writers didn’t think that the main conflict between Downey Jr and Duvall would be strong enough to carry a whole movie, so they compensated by cramming in as many useless side characters and sub-plots as they can. As for those sub-plots, the same problem occurs: in comparison to the main story there is no reason for there to be this many things happening in and around it (resulting in an overly-long two-and-a-half hour running time). Downey Jr’s personal struggles as a parent on the brink of divorce while trying to bond with his young daughter, a mission to reveal the identity of the father of a character’s daughter, Duvall’s deteriorating condition due to an illness revealed later in the movie; these are all things that we’re just skimming the surface with. There’s simply too many things happening for us to get our full attention, and it feels as though things would have been much simpler if they had just stuck to the court case and the bond between father and son, as was probably intended before the writers’ insecurities. Those looking for something completely original as well probably won’t have much luck here either; there are a few too many clichéd plot devices that keep popping up to supposedly add dramatic effect but only remind us of how cheesy and overly-syrupy these devices can be when in the least-competent hands. As a result, the film can become predictable as we draw closer to the finishing line; if you think that by the end that the estranged father and son will in some way work past their differences to work together as well as respect each other as their own kin, then congratulations: you’ve seen a movie before. 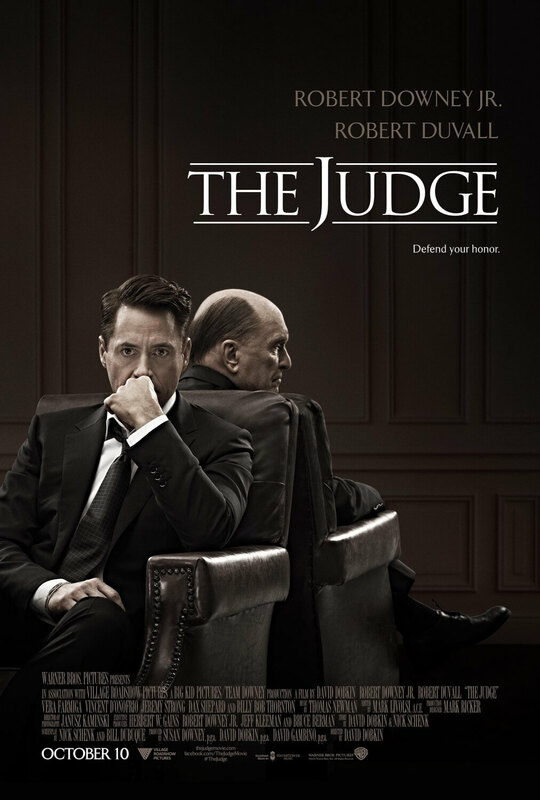 The Judge is a frustrating attempt at drama by comedy director David Dobkin; while getting good performances out of its cast, particularly Roberts Downey Jr and Duvall, at the same time it relies heavily on overly-syrupy sentiment and a predictable storyline as well as an overload of unnecessary supporting characters and sub-plots. Prosecution rests, Your Honour.